This week the Daily Palette is celebrating Taking Shape: Recent Acquisitions in the Fine Art of Craft, an exhibition of decorative arts at the Cedar Rapids Museum of Art (CRMA). This show, on view through February 23, 2014, brings together more than 80 extraordinary works of art in ceramics, glass, wood, and metal from the CRMA collection. Taking Shape explores the shifting nature of the decorative arts and the play between utilitarian and sculptural qualities. During the past 30 years, the debate over the distinction between the fine arts and craft has been a contentious one. Some artists and scholars have dismissed the arenas of glass, jewelry, wood turning, and pottery as not the work of artists, but artisans. Their utilitarian functions have frequently been the characteristic cited for this differentiation. However, craft artists have been redefining these media, and many pieces created within these areas are not functional but sculptural. At the same time, other craft artists have worked diligently to advance the idea that a functional piece can also be aesthetically beautiful, much in the same way that a painting, sculpture, or print can be. The CRMA embraces the traditional "crafts" as works of art and has been actively adding them to the collection. Taking Shape displays some of the Museum's recent acquisitions in this field, and underscores that while all these works celebrate shape, the collection in this area is also taking shape. Mat Rude was born in Decorah, Iowa and currently resides in Iowa City. He earned his BA from Luther College and his MFA from Montana State University. Rude recently spent time in China where he researched indigenous ceramic materials and worked as an artist-in-residence at The Pottery Workshop in Jingdezhen. 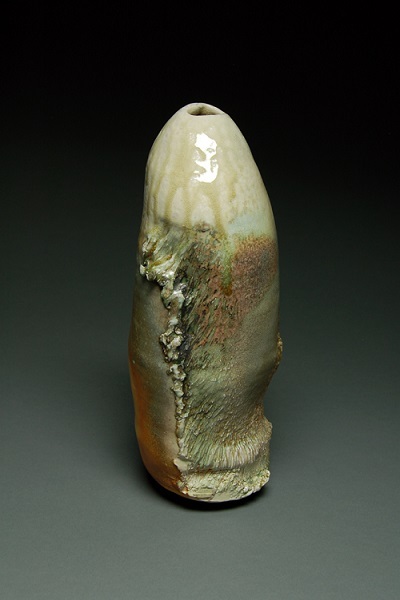 Rude joined the faculty at the University of Iowa in 2008 and has worked as Assistant Professor of Ceramics since 2009. His work has been exhibited throughout the country and internationally, as well as at the following local venues: the Peter Paul Luce Gallery at Cornell College in Mt. Vernon, the Wigley-Fleming Gallery at Luther College in Decorah, The Figge Museum of Art in Davenport, Akar Gallery in Iowa City, the Cedar Rapids Ceramic Center, and the Cedar Rapids Museum of Art.